Are you one of those ladies who like incorporating simple hairstyles because of busy schedules? If yes, you are at the right place. Finding simple yet top notch hairstyles is very challenging. Well, below is a list of marvelous simple and easy to attain hairstyles. Make an effort of checking the list out. As the name suggests, this hairstyle solely suits women with long hair. This hairstyle can be attained from your comfort zone. Start off by combing all your hair straight towards the back of your head. Afterwards, go an extra mile and attain blow dry to give your hair a soft texture. Proceed and give your hair a curly-wavy look throughout the head. That’s not all, take a section of your fringe hair on both sides of the head and plait them. Ensure they conjoin at some point on the back of your head. This top notch hairstyle entails both plaiting and styling up. All your hair should conjoin and settle on your right shoulder. Take a section of your sideways hair on both sides of the head and plait it. Afterwards, sleek them towards your right shoulder. The rest of your hair should be directed towards the right shoulder. This simple hairstyle is flexible in that it gives you the authority to choose the color to incorporate on your hair. 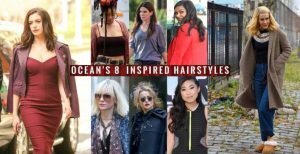 Are you in love with messy layered hairstyles? If yes, check out this gorgeous hairstyle. As the name suggests, this hairstyle suits women with short hair. Start off by incorporating a blend of black and blonde color on your hair. Your right sideways hair should be combed straight behind your right ear. The rest of your front view hair should be divided into numerous layers before given the messy. This hairstyle suits social gatherings and blends with any outfit. Look no further if you are looking for a top notch blonde hairstyle. You need long hair to incorporate this hairstyle as your hair should extend past your shoulders. This marvelous hairstyle gives you the opportunity to showcase your pretty face. Your front view hair should be sleeked either towards the right or the left side of the head. It all depends on the positioning of hair in the head. Additionally, you should give your sideways hair on both sides a wavy look. Simple brunette hairstyle is characterized by a blend of black and blonde color. Your fringe hair should conjoin with your right sideways hair. Consequently, a section of your mid head hair should conjoin with hair on the right side before being combed straight. The rest of your front view hair should be combed towards the left side of the head. Hair on both sides of the head should attain a wavy-curly look. Take your time and check out this marvelous hairstyle. Start off by blow drying your hair to give it a soft texture. This makes it easy to sleek your hair in different directions. Proceed and draw a line that divides your fringe and mid head hair into two parts. This line decides which part of your hair should be sleeked right and which one should be combed towards the left side of the head. Hair on the back of your head should be combed straight. You can give your hair some highlight look on both sides of the head. This hairstyle entails plaiting, the use of gel and sleeking your hair upwards to form a bun at some point on your mid head. Your fringe hair and a section of your mid head should be plaited. Proceed and sleek hair on both sides of your hair towards the back. Conjoin your hair at some point at the back of the head and form a bang with a wavy look. Consequently, you are encouraged to systematically apply gel on your hair. As the name suggests, this hairstyle states that your hair should attain a curly look throughout your head. Consequently, you need long hair to incorporate this hairstyle. Your fringe and mid head hair should attain a mixture of black and blonde color, whereas your side head hair should attain a pure blonde look. Your fringe and mid head hair attain a messy layered look on your mid head. On the other hand, your sideways hair should be combed straight on both sides of the head. Simple straight hairstyle can be incorporated by anyone, provided you have long hair. It is characterized by your fringe hair being combed straight on top of your forehead. Your fringe hair should conjoin with hair on the left side of the head. Most of your mid head hair should be combed towards the left side of the head. The rest of your front view hair should be combed straight towards the right side of the head. This is one of the simplest and easy to attain prom hairstyle. Your hair should attain a blend of black and blonde color throughout the head. Consequently, most of your hair should rest on the back of your head. Divide your hair into numerous layers before conjoining them at the back of your head. As the name suggests, this simple hairstyle suits wedding events. Wedding hairstyle insists that your entire hair should be combed towards the back of the head. Start off by giving your hair a blonde look. This top notch hairstyle doesn’t limit you to blonde color. You can incorporate any color that meets your needs. Consequently, give your hair a layered look before combing it towards the back of your head. Wedding hairstyle mostly suits women with long hair. Anyone can incorporate the bob hairstyle, provided you have long hair. Bob Hairstyle is characterized by your entire hair attaining a curvy look. A line should be drawn to separate your left sideways hair from the rest of your front view hair. Your fringe hair should be combed straight on top of your forehead. Your mid head hair and the remaining front view hair should be combed towards the right side of the head. Above all, your hair should remain within your neck region. As the name suggests, this hairstyle is characterized by a bun on the edge of your mid head. Consequently, your fringe hair should be combed straight towards your forehead and should conjoin with both sides of the head. Subsequently, your right and left sideways hair on both sides of the head should be combed straight. Your mid head hair and hair on the back of your head should be conjoined and sleeked upwards to form a bun. Do you have long hair? If yes, check out the marvelous Ombre hairstyle. Ombre hairstyle is described using both black and highlight color. A section of your mid head hair should be conjoin with your right sideways hair and another one with your left sideways hair. Afterwards, comb your sideways hair straight on both sides of the head. This statement also applies to hair on the back of your head. That’s not all, take your fringe hair and plait it on both sides of the head. You should have long hair to eligible for this simple to attain yet marvelous hairstyle. Balayage hairstyle is characterized by your front view hair being combed either towards the right or the left side of the head. Consequently, hair on the back of your head should be combed straight. That’s not all; your hair should attain a blend of black, white and gray color. This is what makes this hairstyle stand out from other related hairstyles. Proceed and give your hair a wavy look. This marvelous hairstyle is characterized by your hair attaining a blonde look and increasing in length when extending sideways on both sides. Additionally, your hair should remain within the neck region. This hairstyle suits older women with busy schedule. Your front view hair should be sleeked either towards the right or the left side of the head. It all depends on the positioning of your hair. Consequently, this hairstyle suits whichever event that comes your way. Look no further if you are looking for a top notch hairstyle for your hair. It is characterized by hair remaining within the neck region. Start off by drawing line to separate your right sideways hair and your mid head hair. Proceed and comb your right sideways hair straight towards the right side of the head. The rest of your front view hair should be sleeked straight towards the left side of the head. That is your mid head hair, fringe hair and your left sideways hair. Consider this marvelous if you have long thick hairstyle for your hair. Blow dry your hair to give it a soft texture. Proceed and draw a line to separate your mid head and fringe hair into two parts. One part should be combed facing the right side of the head and the other one left. Your side head hair on both sides of the head should attain a curly-wavy look and should extend past your shoulder. Are you still confused on a simple hairstyle to incorporate on your hair? If yes, check out the spectacular homecoming hairstyle. Homecoming hairstyle is characterized by a curly-wavy look throughout the head. Consequently, your hair should attain a blonde look throughout the head. Homecoming hairstyle is also attributed with braids that conjoin a section of your hair. Above all, your hair shouldn’t go past your shoulder length. It is definitely worth checking out. As the name suggests, this hairstyle is characterized by three braids and a single bun on the back of the head. You are encouraged to blow dry your hair before diving it into four sections. Hair on each section should be conjoined together before being plaited. Hair on the back of your head should be coiled together to form a bun. This is one of the simplest and easy to attain hairstyles in this list. This hairstyle is characterized by a blend of numerous colors, plaiting and sleeking most of your hair towards the back of your head to form a ponytail. Ponytail hairstyle is attributed by black, white and highlights colors on your head. Consequently, a section of your fringe hair and mid head hair should be conjoined and plaited together. That’s not all; a section of your front view hair should be combed towards the left side of the head. 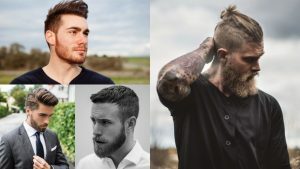 Look no further if you are looking for a top notch hairstyle that connects you with the youth. You should draw a line to separate you right sideways hair with the rest of your mid head hair. Comb your right sideways hair straight and ensure it rests on behind your right ear. The rest of your front view hair should be combed towards the left side of the head. Ensure your hair attains the wavy look. This simple hairstyle is only suitable for people with long hair. It is characterized by long hair stretching past your shoulders on both sides of your head. Your entire hair should attain a blonde look throughout the head. Separate your front view hair into two parts through a line. One part should rest towards the right side and the other on the left side of the head. Ensure your side head hair on both sides attain a wavy look. Consider this simple hairstyle if you desire a natural look. Your encouraged to blow dry your hair to enhance both its texture and its looks. Additionally, anyone can incorporate this hairstyle, regardless of your hair type. This marvelous hairstyle encourages that your hair should remain within the neck region. Finally, ensure all your hair is sleeked backwards. That is your fringe hair, mid head hair, sideways hair and hair on the back of your head. You are encouraged to visit your stylist if you desire to look marvelous in this hairstyle. Boho hairstyle entails plaiting, giving your hair a layered look and combing a significant amount of your hair straight. Most of your hair should rest behind your back. It is evident Boho hairstyle only suits casual hairstyles. However, it can be customized to suit official functions. Lastly, you can easily maintain top notch hairstyle. Look no further if you are looking for a simple Updo hairstyle. Start off by giving your hair a blend of black and brown color. However, black color should dominate most part of your head. Proceed and conjoin all your head hair at some point on the back of your head. Afterwards, form a bun look design facing upwards. As the name suggests, this marvelous hairstyle suits wedding events. It is characterized by your hair attaining a wavy look throughout the head. Most of your hair should be sleeked towards the back and should increase in length going backwards. Take a section of your fringe and sideways hair on both sides of the head and conjoin them together. Afterwards, plait and conjoin them to form a throne like look. As the name suggests, this hairstyle focuses on helping your hair attain a bun look design at some point on the back of your head. Blow dry your hair if you wish to enhance its texture. Proceed and divide your hair into numerous sections. This is what makes this hairstyle look marvelous and recommended for numerous people. These sections should conjoin at some point on the back of your head to form a bun look shape. Look no further if you wish to attain a shaggy look on your head. This hairstyle is characterized by your hair being combed straight towards the direction it is facing before attaining the shaggy look. Your fringe hair should be combed straight towards your forehead. Hair on the back of your head should be combed straight. The rest of your front view hair should be combed either towards the right or the left side of the head, depending on its position. It is definitely worth checking out. This is another easy to attain top notch hairstyle. In fact, you can design it on your own. Give your hair a blend of black and blonde color. Afterwards, comb all your hair backwards. Proceed and take a section of your fringe and sideways hair and both sides of the head. Intertwine them in a twisting position to attain a marvelous look. You should definitely try this hairstyle out. You need long hair to incorporate this hairstyle. Your fringe and mid head hair should be divided into two parts by a line. One section should be sleeked right and the other one left. Additionally, your sideways hair should attain a curly-wavy look on both sides of the head. What are you waiting for? Incorporate this marvelous hairstyle.